Albino birds are not particularly unusual. I’ve seen white robins, jays, crows, peacocks, and others. And of course there are white domestic chickens, ducks, geese, and turkeys. The whole explanation of feather color is fairly complex, but let’s just discuss pigments for the time being. These pigments fall into three main groups –yellow, red, and black/brown colors. The pigments are deposited into the feathers as they grow and the combination of pigments and feather structure form the colors and patterns of the birds’ feathers. (There are no blue pigments in birds; blue birds are actually brown-pigmented, the feather structure producing the blue color.) Since most birds have a summer and winter plumage, there may be two or more plumage patterns in one species every year and the proportions of pigments change. Ptarmigans, chicken-like birds of the far north and tundra, molt to an all-white plumage in the winter for camouflage. With such a demanding physiological process, it is no wonder that occasionally things go awry. Sometimes there is a total lack of pigments and the result is a totally white bird with a red eye – a true albino. Some birds are totally white but have colored eyes (the iris) and are not true albinos. Just a short time ago a friend sent me a photo of an albino hummingbird. Occasionally there is a dilution of the pigments which produces a faded version of the bird. I had a gray and white Yellow-billed Magpie visiting my backyard with a flock of normal colored black and white magpies. This is called incomplete albinism. There are a number of birds that have light and dark phases, where incomplete albinism has become a permanent condition in the species. And then there are just plain dilutions of dark feathers.The Red-tailed Hawk shows a gradation of feather darkness from very dark to very light. Populations of the Fox Sparrow on the Pacific coast are darker in the southern part of their range and lighter as one goes northward. There is also partial albinism in which the bird shows patches of white or individual white feathers among its normal plumage. This is very common in House Sparrows for some reason, but can be seen in many other birds, especially the soaring hawks. Ever notice that many birds that are almost all white have black wing tips – their primary flight feathers? This is typical for gulls, terns, Snow Geese, Wood Stork, White Pelican, and others. The reason is that the black pigment (melanin granules) strengthens the feathers which are most subject to wear and tear. Herons and white swans are the only exceptions as they have other adaptations in their primary feathers to avoid excessive wear. So what happens to the hapless white robin or jay in its habitat surrounded by normal colored birds? If not eaten by a predator because it stands out, it is rejected by any potential mates. 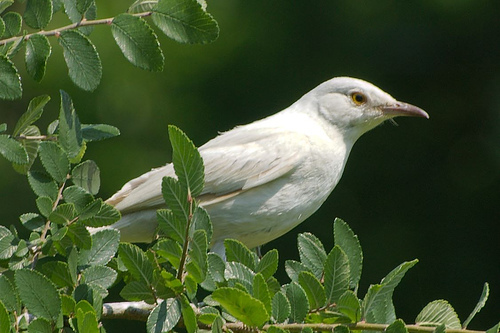 White may imply clean and pristine in the human world, but the meaning is very different among birds.